Marshall's House (1932) by Edward Hopper. Throughout his career, New England - first Gloucester, later Maine, and finally Cape Cod - was the source for much of Hopper's subject matter. These coastal communities were popular destinations for artists, but the independent-minded Hopper remained distant from his colleagues, dryly noting, "When everyone else would be painting ships and the waterfront, I'd just go around looking at houses." He had a penchant for architectural styles of past centuries, especially the Victorian, with its heavy ornamentation and mansard roofs. He rendered these houses with dramatic light and often in isolation. Along the coast of Maine, where Hopper visited in the late 1920s, he painted lighthouses, solitary beacons amid the landscape. Full of intrigue and mystery, Hopper's lighthouses surpass their utilitarianism and assume a commanding presence - no longer mere incidental structures like those in the seascapes of other artists. Beginning in 1930, Hopper and Josephine Nivison (who wed in 1924) spent summers on Cape Cod, where the couple eventually built a house and studio in the town of Truro. There, Hopper's style became more geometric, perhaps inspired by the architecture of the region's saltbox constructions. Always a realist painter, and critical of many modernist trends, Hopper nonetheless inched toward abstraction in these simplified compositions that experimented with the interplay of colour, form, and light. 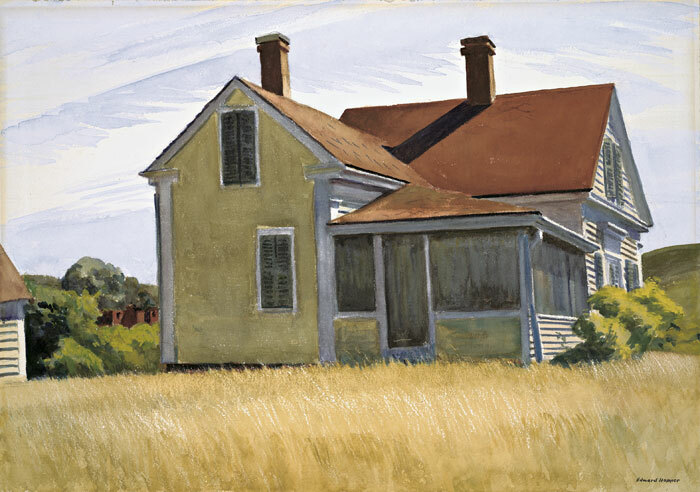 For Hopper, however, architecture was never reducible to mere form - it always remained in dialogue with nature. As the artist plainly remarked later in his career, "What I wanted to do was to paint sunlight on the side of a house." "'Marshall's House' - that one was the most open to interpretation. It's a painting of a house, with blacked-out windows. So I struggled for a toehold with that one. In the end, I wrote it about a night 10 or 15 years ago when I thought I'd died. 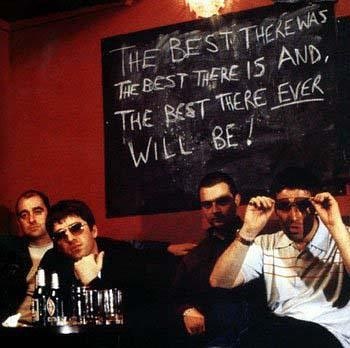 "This was before we'd made the first Stone Roses album. It was the first time I heard Electric Ladyland. 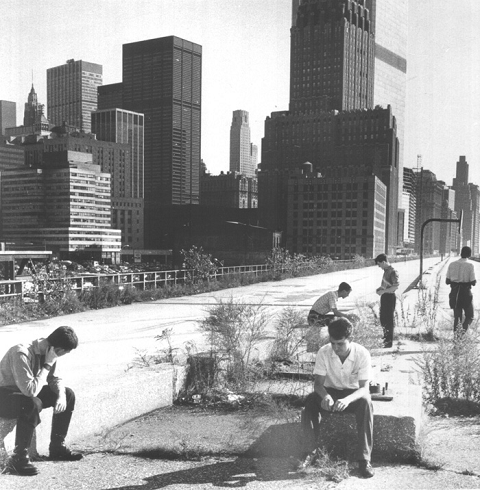 The real low point came in 'Death Valley 69' (by Sonic Youth) and I came out of it to A Certain Ratio, I can't remember the title of the song. But between those records, I was convinced I was dead. So I transplanted a second-floor flat in Chorlton onto this Edward Hopper timber country-house in New England." 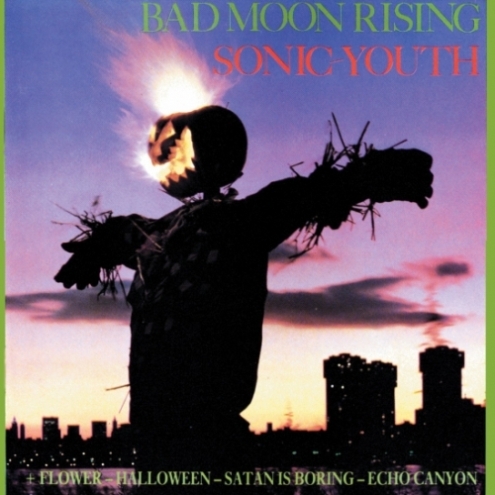 Top left: Death Valley '69 is the closing track on Sonic Youth's 1985 album, Bad Moon Rising. Top right: A Certain Ratio are a post-punk band formed in 1978 in Manchester. While originally part of the punk rock movement, they soon added funk and dance elements to their sound. 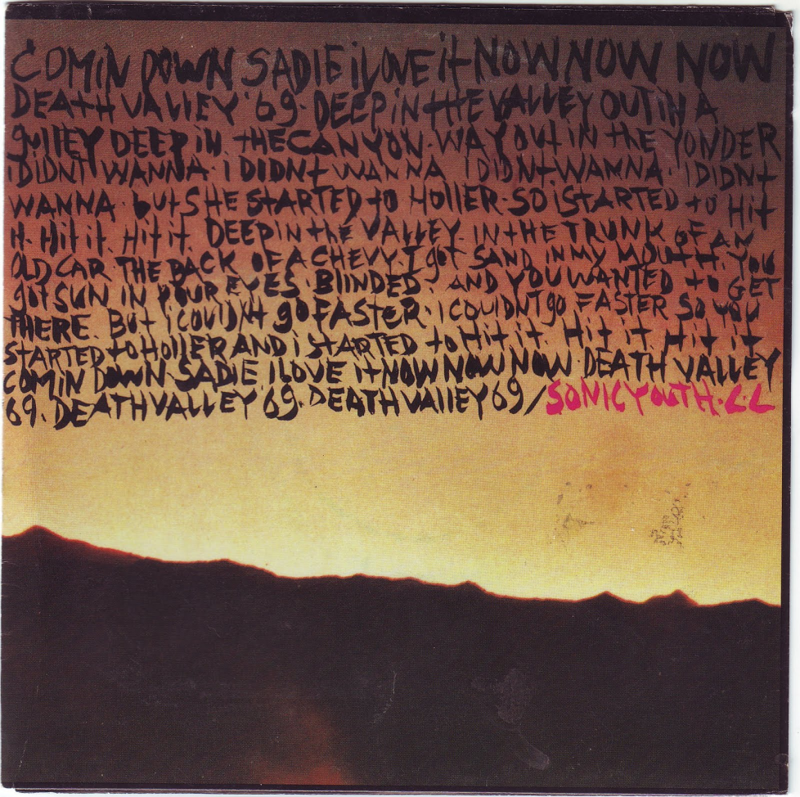 Bottom: The cover artwork for Death Valley '69, featuring the song's lyrics inscribed on a Gerhard Richter landscape, was possibly the subconscious starting point for Squire's Twombly-leaning artwork. 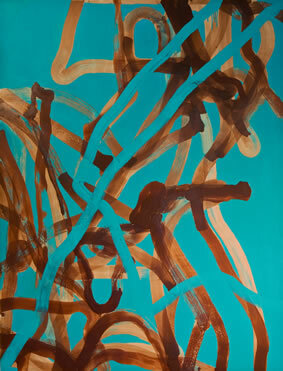 Why does Pollock appeal to you ? When I first saw his stuff I was heavily into The Jesus and Mary Chain and it seemed like the visual equivalent of that feedback and masking. 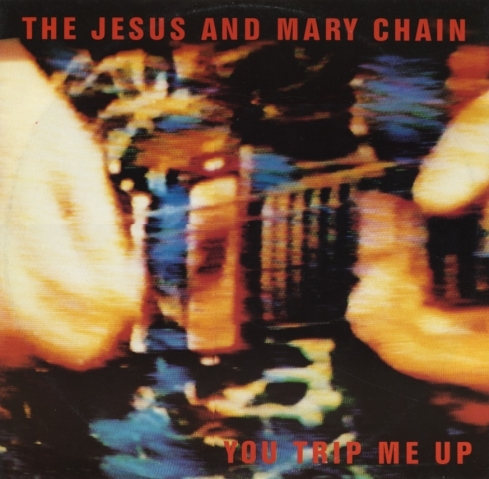 Taking a leaf out of the Noel Gallagher guide to songwriting (Fool on the Hill and I Feel Fine), the titles of two early Jesus and Mary Chain singles, 'You Trip Me Up' (May 1985) and 'Never Understand' (February 1985), are fused here for one lyric (both songs are to be found on their 1985 debut album, 'Psychocandy'). Top left: Brothers William and Jim Reid. 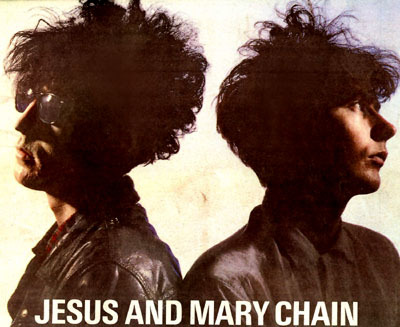 The Jesus and Mary Chain were a vital bridge in British rock between punk and the 90s. Speaking to Dave Haslam of Xfm Manchester on 13th June 2007, Squire recalled: "We had no pop sensibility in our music until I heard the Mary Chain; they really knocked me into shape. The Mary Chain just showed me there was a way of combining what I loved about punk rock and what I loved about the Beach Boys." 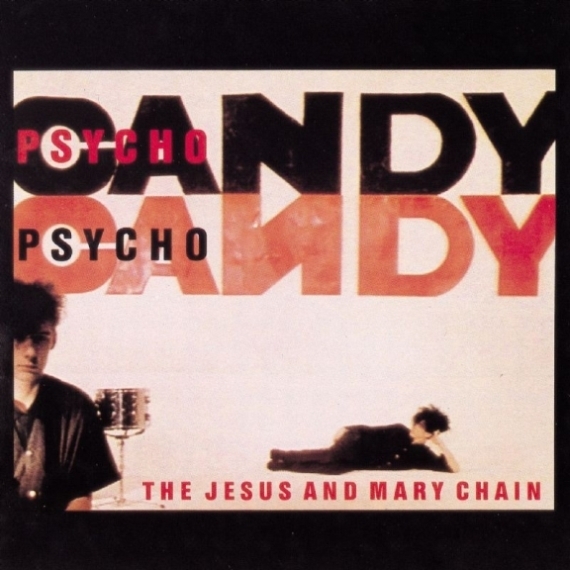 Top right: Arguably no other record from the 1980s was as important to John Squire's musical development as Psychocandy (November 1985) by The Jesus and Mary Chain. This debut LP by the godfathers of shoegaze combined killer hooks with guitar fuzz overloaded and blasted at ear-splitting levels. 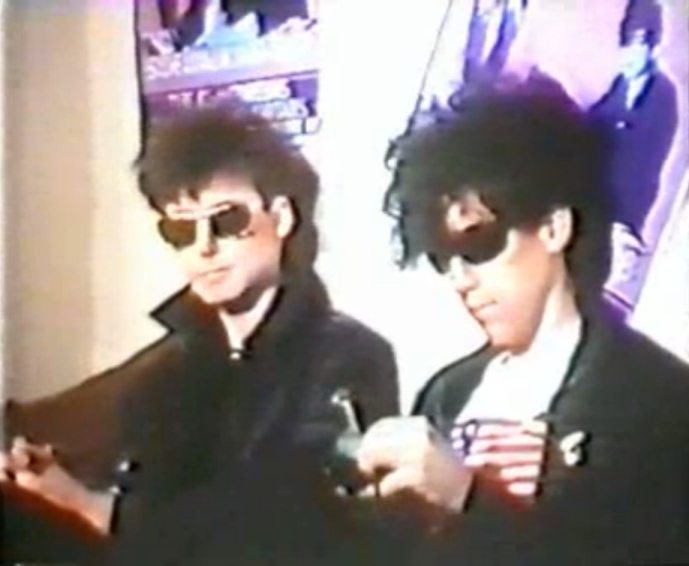 The Jesus and Mary Chain were a band without a middle. There was only melody and noise, beauty and violence, love and hate. William Reid's metallic guitar sound on the record slices across Jim's brooding whispers like razors. "That's why Psychocandy was so incredible when it came out, that it could be so modern and powerful yet doff its cap to Brian Wilson and Phil Spector." (Squire speaking to The Guitar Magazine, July 1995). 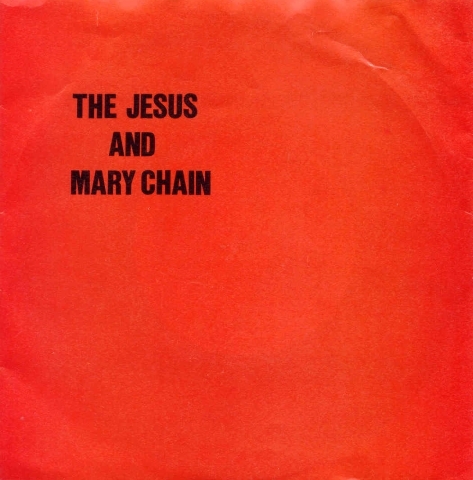 This is perhaps The Jesus and Mary Chain's greatest legacy, the realisation that punk rock / industrial noise was not diametrically opposed to pop melody, that the two could be woven together into music far more than the sum of its parts. In an NME interview from July 1990, The Stone Roses cited The Jesus And Mary Chain ("'Psychocandy' had a groove to it"), The Smiths, Public Enemy and De La Soul as the best bands of the '80s. Middle left: You Trip Me Up vinyl cover. This single featured in a fax sent by John Squire to Select magazine in 1997, in which he was asked to list his ten favourite songs: "I loved the TV distortion picture cover for this one and the sonic action painting approach to the guitar overdubs...another example of the endless permutation the brothers found for those three chords - changed the way I thought about writing songs." Middle right: Never Understand vinyl cover. Bottom right: A 2007 artwork entitled 'Jesus and Mary' (oil and wax on canvas, 70" x 54") by John Squire. "I think the Roses were mainly influenced by three bands - by The Jesus and Mary Chain early on, 'cos I remember they used to show up at Mary Chain gigs at the Hacienda in '85-'86, but the two bands the first LP was influenced by were an American band called The Three O'Clock and Primal Scream. Nobody else has really picked up on that, but melodically that record was a cross between The Three O'Clock and Primal Scream. I lived in Manchester in 1988-1989, and that's when I first met Mani, so I used to hang out with them and drink with them and I know that was what they were into. And John Squire around that time was supposedly massively into Santana." Death Valley '69 numerically provides a lyrical stimulus; the repeated "going down" lyric (see the influence of 'If 6 was 9' on Going Down) follows an earlier reference to Hendrix in "Jimi play your black guitar" - Hendrix's trademark black Fender Stratocaster. Marshall's House, an homage to Jimi Hendrix (whose middle name was Marshall), recalls Squire's first exposure to Electric Ladyland. One can imagine that Marshall's House is stacked wall-to-wall with Jimi's amp of choice, the Marshall amplifier. In his prime, John Squire 'lived with Red House' for a while, and on this title track, he sets up camp in Marshall's house, delivering an array of trademark Jimi guitar effects. 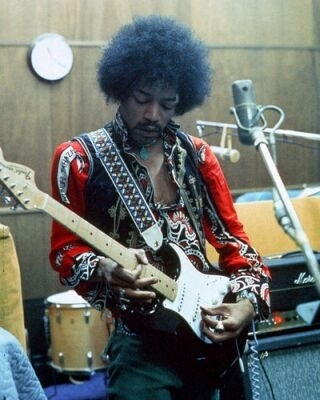 Hendrix expanded the vocabulary of the electric rock guitar more than anyone before or since; studio works such as 'Third Stone from the Sun', 'Bold as Love' and 'Voodoo Chile (Slight Return)' introduced the world to a new use of the Stratocaster vibrato. 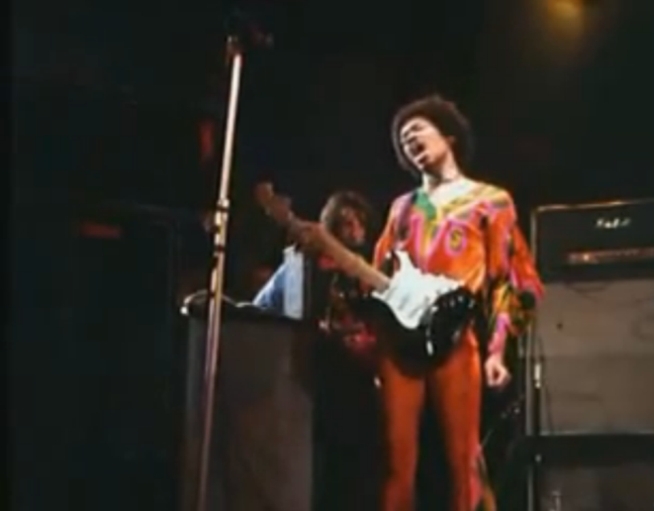 Live performances of 'The Star-Spangled Banner', 'I Don't Live Today' and 'Machine Gun' featured the vibrato being used to emote bombs, rockets, and other sound effects, all within the context of blues-based psychedelic rock. Squire's explosive opening 20-second guitar burst on Begging You, Brussels 1995, has several hallmarks of Are You Experienced by Hendrix at Winterland (1968). The Fool's Gold workout on The Stone Roses' 2012 reunion tour would see a more pronounced level of experimental feedback and guitar pyrotechnics from Squire. There is a reference to the Leni Riefenstahl (1902 - 2003) film, 'Triumph Of The Will' (1935), the zenith of Nazist film propaganda and hugely influential directorially (see the end of Star Wars Episode IV). U2's 1993 Zooropa tour wove looped video from Triumph Of The Will and Olympia, with various war and news imagery sources, projected on a giant screen. 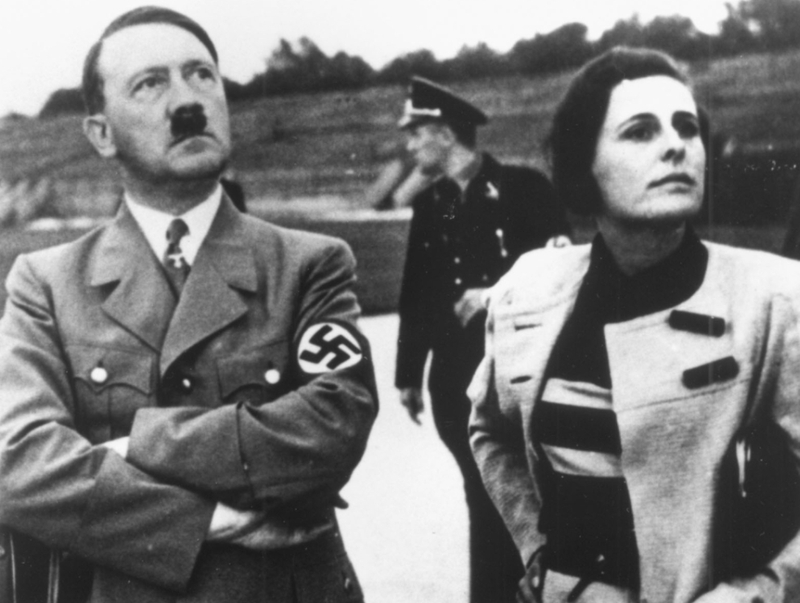 Adolf Hitler with Leni Riefenstahl.